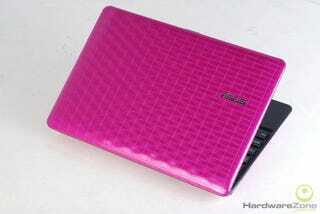 HardwareZone got the scoop on this upcoming Seashell 2 netbook designed by Karim Rashid. It has a 1.8GHz Pineview Atom N450 CPU, Windows 7, and a new slide-out battery…but its other specs are boringly normal—no Nvidia Ion graphics. Actually, the slide-out battery isn't the only change compared to the original Seashell 1008HA (which had a non-removable battery). The keyboard on this 10-inch screen revision has gone chiclet, and there's a new VGA adapter that connects via mini-USB, and hides away in a recess underneath the netbook. Those other standard specs I mentioned look to include 1GB of RAM, 160GB hard disk, 802.11n Wi-Fi, and Bluetooth. And if pink isn't your thing, Fudzilla also has pics of the faux crocodile skin finish in brown.